Many of us love books. It's not just about the reading but there is also the pleasure of holding a book and turning its pages. However, books do eventually age. Spines come undone and the next thing you know, the book falls apart. Lana Manis, whose Etsy store, Simple Joys Paperie, is filled with her delightful crafts featuring recycled vintage books. The pages of the books go towards making vintage book wreaths. 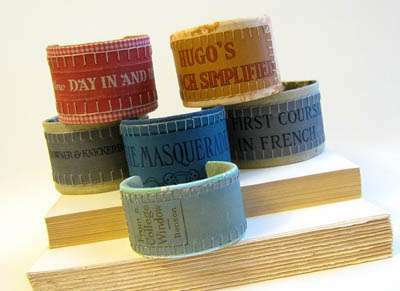 However, the book covers were saved for her Vintage Book Spine Cuffs collection. Cool! Not just any books but vintage French ones! 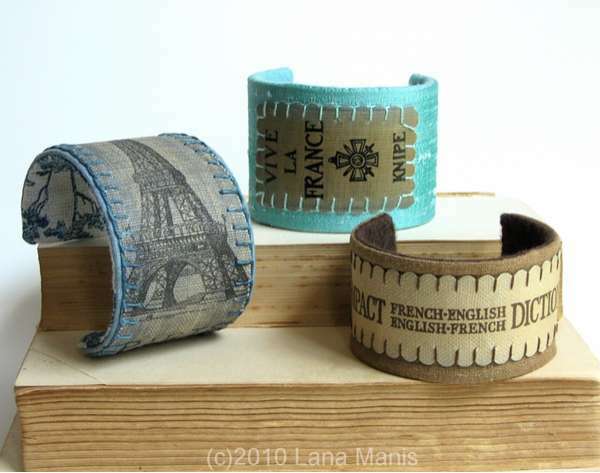 I totally agree with Lana that her bracelets made from book covers will make great gifts for book lovers, librarians and perhaps in the case of the French books, linguists. But most of all, these will appeal to those who want a one of a kind eco jewelry. I absolutely LOVE this idea. It's so unique, personal and just great looking. Super idea!!! What fabulous bracelets!!! Mr. Sequin and I know a lot of librarians, book artists and book lovers who'd be super excited about them, too. 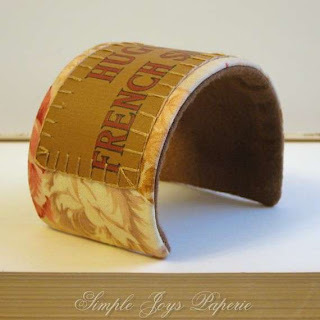 My shop is nearly empty of the book cuffs right now, but I'll have new ones listed in January. My daughter's birthday is in February, perfect give for my little English major! I love these!!! What a great way to recycle old books. These would make absolutely wonderful unique gifts for book lovers & teachers.